"An organization of 187 countries, working to foster global monetary cooperation, secure financial stability, facilitate international trade, promote high employment and sustainable economic growth, and reduce poverty”. I smiled when I begin reading the statement but at the end of it, it made me Laugh. I have the privilege of belonging to a member country of IMF where IMF is “Promoting high employment and reducing poverty”. -United States of America -Japan -Germany -England -France. Debt is one of the most important weapons with which the big capitalist powers dominate poor countries. It is used as a means of blackmailing the poorest countries. A legitimate way to theft the resources. No need to invade them. The IMF and World Bank today have a strong influence over economic policies in many countries. The inability of many countries to repay their debt has made them dependent on new loans. The IMF has the power to declare countries credit worthy – or not. To get the approval countries have to accept the conditions of structural adjustment programs. They have to restructure their economies according to IMF/World Bank guidelines. Countries in financial difficulties can get financial assistance in the form of LOANS bestowed to them after signing WASHINGTON CONSENSES that condition to launch certain financial reforms in the country. Those reforms are friendly to the Economy and honestly intended to bring Prosperity in country, this is believed by IMF Masters and Poor countries must have faith in it. The fact is, these suggested reforms have the purpose of ensuring IN WHAT EVER WAY, the LOAN is to be repaid. There is ridiculous system to determining the credit worthiness of country and accordingly to charge higher or lower rate of interest. Poor countries are charged higher interest since the Risk is high and stable economies are charged lower rate since the risk is low. In other words it is based on principle “The more you are poor and miserable, more you will be looted”. Dying economies has no option but to accept the Debt Vacation on their terms. Poor Governments has to pay large amount on account of Loan repayment to IMF that supposes to invest in Country’s health, education infrastructure sector and Development. Governments Imposes Taxes/ Levies to utmost levels to ensure debt repayment. Governments cut short its spending on Education, industries and employment generating programs at the crucial phase when it is badly needed. In Actual the wretched Laborers, farmers and workers which already don’t even have enough for their livelihood, sweat the whole day, burn their blood to pay large amount of their wages to IMF. Handsome amount of capital in form Interest is transfer form struggling economies to Rich countries. Generations are being mortgaged to the IMF. Developing nations pay the West nine times more in debt repayment than they receive in "aid" from Western countries. For example, after devastating floods in Mozambique - destroying the homes of more than a million people – Western countries coughed up a tiny US$ 40 million in "aid." But Mozambique pays more than US$ 70 million dollars a year in debt repayments to Western banks! In Africa as whole, where only one child in two goes to school, governments transfer four times more to banks and the lenders in the West than they spend on health and education. Even the United Nations (UN) has to admit that: "If government invests in human Developments rather than debt repayment, an estimated three million more Children would live beyond their fifth birthday. 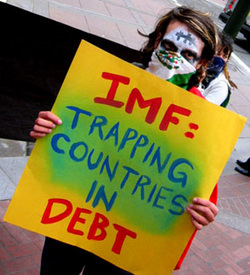 Figures tells the bitter reality that in most of countries who Debt trapped by IMF, unemployment, poverty and crimes multiplied many times. IMF support of trapping the country’s citizen through supporting the dictators is not hidden to the world. Most Notorious of the IMF tool is Structural Adjusted program (SAP), It devastated many countries through it. When country doesn’t pay the debt its Valuable Assets are forced sold in name of privatization to exploitative foreign investors at Very LUCRATIVE Prices. Argentina was the victim of IMF where Through Very comprehensive SAP Program its, public assets were sold. Then they taxed the people high. Its currency value destroyed. Whole south America is singing songs of their Debt trap. Iceland and Latvia were loaded with the foreign creditor’s debt. 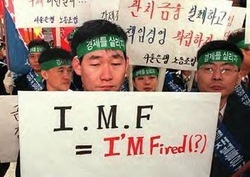 IMF offered a rescue loan to the government to replace the Debt with theirs. The money rested no time in the country and was paid to foreign creditors. Now Noble Taxpayers left with new Loan. Taxes were raised which just makes a bad economic situation worse. Valuable and important spending is cut when they are most needed. Then, the IMF "advisors" come in and start to make a lot of demands to sell off Public infrastructure to the folks belong to the USA, UK at Very for very cheap consideration. Nations are being enslaved through the shackles of debt. They are deliberately kept poor so that these aristocratic countries have access cheap raw material and cheap labor market. Awareness doesn’t create among poor people that how these rich countries and their multinational are sucking blood out of their dead veins. My country, Pakistan is also going through IMF REFORMS. Electricity rate is hiking every month. IMF is pressurizing to increase the Tax collection. Inflation is on rocket. Poverty and unemployment is increasing, newspaper daily tells horrible stories of suicides. Recently IMF officials arrive in Islamabad with new reforms. I know Taxes will super hike which me and my Noble countrymen has to pay. We are being exploited by Western countries and we have to swallow this Mordant truth.